I’m a few days late but I wanted to note the latest employment (jobs) report and the first revision to 3rd quarter GDP. There’s really not much news here – it’s the same old story. The economy continues to move along somewhat like a zombie. Not really dead, but definitely not anything you could call “living”. That’s particularly true if you’re one of millions of unemployed who need a job to “make a living” but can’t get one. 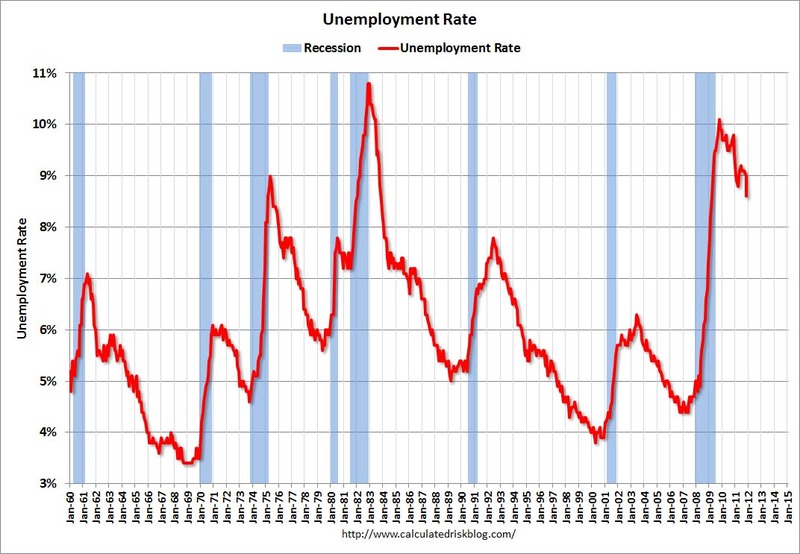 The following graph shows the unemployment rate. The unemployment rate declined to 8.6%. Some of the decline in the unemployment rate was related to a decline in the number of workers in the labor force. The second graph shows the job losses from the start of the employment recession, in percentage terms. The dotted line is ex-Census hiring. This was still a weak report, and slightly below consensus. The headline unemployment rate declining from 9.0% in October to 8.6% in November is deceptive. It is NOT because economic growth created enough new jobs to start making a significant dent in the millions of unemployed. Instead it was almost entirely due to the labor force shrinking. In other words, approximately 300,000 would-be workers abandoned their search in frustration and discouragement. If the economy starts to grow briskly (not much chance of that happening) then these discouraged and “marginally attached” workers will likely renew their searches and rejoin the work force. Calculated Risk also tells us how just before Thanksgiving the estimate for 3rd quarter real GDP growth was revised downward. Real gross domestic product — the output of goods and services produced by labor and propertylocated in the United States — increased at an annual rate of 2.0 percent in the third quarter of 2011 (that is, from the second quarter to the third quarter) according to the “second” estimate released by the Bureau of Economic Analysis. This was revised down from 2.5% and below the consensus of 2.4%. The relatively large revision came from having better data about the change in business inventories. In GDP accounting, when a business produces goods it counts as “production” and part of GDP, even if the goods haven’t been sold yet to a final customer. Additions to inventory then are considered to be a form of “business Investment”. A decline in inventories tells us that businesses (in aggregate) sold more from their inventories (previous production) than they produced. A large decline in inventories can be either a good or bad sign. It’s good if it happens because sales were unexpectedly higher than managements expected. That would suggest that production would be increased in the next quarter. On the other hand, a decline in inventories can also be a sign that businesses expect future sales to be weak and so they didn’t produce as much in advance. We’ll have to see which it is. Regardless of why the inventory adjustment was so large, a 2.0% real growth rate is unacceptable. It wouldn’t even be acceptable at full employment, but with 8.6% unemployment it’s totally unacceptable. First an update on a post I made a few days ago. When I commented last Monday on President Obama’s jobs proposal, I was less than excited. Having read more detail of the proposal, I should correct some statements I made. I incorrectly left the impression that the payroll tax (Social Security/Medicare tax) cut that the President was proposing was only an extension of the present year cut that is scheduled to expire December 31, 2011. In fact, the President is proposing not only a 1 year extension of this year’s temporary payroll tax cut, but an increase in the size of that tax cut. Estimates are that for a median household income of near $50,000, it would result in a $1,500 reduction in payroll taxes compared to not having any payroll tax cut at all. However, the existing, this-year only, payroll tax cut had already cut payroll taxes by up to $500 per household. So of the claimed $1,500 tax cut for next year for the median household, $500 is an extension of this year’s situation and $1000 is new stimulus. Today’s economy is weak even with the existing temporary $500 tax cut, so extending that cut won’t improve things. It will only prevent things from deteriorating further. In my world, simply agreeing to not put on the brakes is not the same thing as actually hitting the accelerator. But, the proposal does contain perhaps $1000 worth of tax cut stimulus to nearly all working households. That’s perhaps $150 billion of pure, new stimulus to economy. It’s more than I estimated on Monday, so the plan will likely have some more stimulative effects than I thought. But how much? Let’s do a quick “back of the envelope” type calculation. The proposal puts $150 billion in consumers’ hands that wouldn’t have been there without it. But for this money to generate jobs, people have to spend the money. Simply saving the money or paying down debt won’t cut it. That improves individual household balance sheets but it doesn’t cause any firm out there to go “oh, more business! I need to hire people!” In normal times like the 1960’s or 1970’s people would have spent 85-90% of the tax cut. But these aren’t normal times. We live in high debt, high debt payments, and scared-of-the-future times. More people save in these kind of times. (paying down debt is economically the same as savings – think of your debt as a negative balance in a savings account). Let’s assume that people spend 2/3 of the money. Both history and theory indicate that people save more of a tax cut when they know it’s temporary, but let’s be generous/optimistic and say 2/3 gets spent. That’s $100 billion in new spending. Now when it gets spent, it generates business demand and jobs. Those people get paid and then they go spend the money again – the circular flow of money in the economy. How much? That’s a huge controversy in empirical macroeconomics. This is the question of what the spending multiplier is. Estimates vary widely, although often the studies are heavily biased by ideology to begin with. Let’s be modestly optimistic and say the multiplier is 1.5 – 2.0. This is a relatively high estimate given recent studies as far as I know, but let’s run with it. That means that after some months, this initial $150 billion in tax cuts becomes $100 billion in new, initial spending which ultimately increases total spending by $150-$200 billion. Total spending is another way of saying GDP. This puts it in the range of 1.0% to 1.5% of GDP. There’s a rule of thumb about the relationship between changes in GDP to changes in unemployment rate. It’s called Okun’s Law. It’s not a law so much as a statistical regularity. There are many versions, but let’s use a real simple one: each 2 percentage point change in GDP equates to a 1 percentage point change in the unemployment rate. So if we have GDP growth increasing by 1.5% points, we can count on unemployment rate going down by 0.75 to 1.0% points. We’re currently over 9% unemployment rate and stuck there. I’m not real excited about a proposal that aims to reduce the unemployment rate from over 9% to maybe 8%. We know 4-5% unemployment is possible. We did it in 2006 even with the slow-growth policies of the Bush administration. We did better than that under Clinton. In the 1960’s we were even below 4%. Why are we settling for tepid responses and setting goals of only getting to 8% unemployment and then calling this “bold”? I don’t know. But then maybe I’m just a grumpy old man. Nonfarm payroll employment was unchanged (0) in August, and the unemployment rate held at 9.1 percent, the U.S. Bureau of Labor Statistics reported today. Employment in most major industries changed little over the month. Health care continued to add jobs, and a decline in information employment reflected a strike. Government employment continued to trend down, despite the return of workers from a partial government shutdown in Minnesota. +46,000 to +20,000, and the change for July was revised from +117,000 to +85,000. 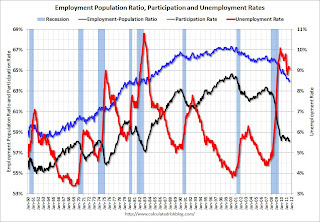 The following graph shows the employment population ratio, the participation rate, and the unemployment rate. The unemployment rate was unchanged at 9.1% (red line). When looking at the detailed numbers we find that the private sector created a net total of 17,000 new jobs. Unfortunately this was entirely offset by government reducing employment by 17,000 jobs. I suppose for Tea Party and Conservative types who blame government for most all economic ills and who fantasize about a society with no government, this is moving towards their ideal economy. Somehow, I don’t see it that way. Further details behind the numbers show that the number of private sector jobs was likely understated by 45,000 since during the survey week the 45,000 Verizon workers who were on strike were not counted as having jobs. Those jobs will return in the report on September, assuming Verizon doesn’t lay off some of them. The red line is moving sideways – and I’ll need to expand the graph soon. 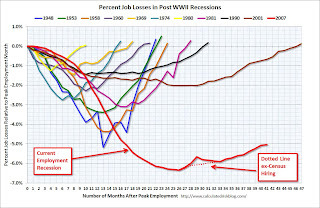 The current employment recession is by far the worst recession since WWII in percentage terms, and 2nd worst in terms of the unemployment rate (only the early ’80s recession with a peak of 10.8 percent was worse). U-6, an alternate unemployment rate measure that includes both traditional unemployed (no job but looking), part-time workers who want but can’t full-time hours, and some other marginally-attached workers has risen to 16.2%, a new high for this year. There are 13.967 million Americans unemployed now. Of those unemployed workers, 6.0 million have been without a job and looking for work for over 6 months. The previous reported totals for both June and July were revised downward. Unemployment Benefits Cut Will Worsen Things. NELP’s new analysis shows that in 2011, six states cut the maximum number of weeks that jobless workers can receive unemployment insurance to less than 26 weeks—a threshold that had served as a standard for all 50 states for more than half a century, until this year. Michigan, Missouri, and South Carolina cut their available weeks down to 20; Arkansas and Illinois cut down to 25; and Florida cut to between 12 and 23 weeks, depending on the state’s unemployment rate. Double-digit unemployment in Michigan, South Carolina, and Florida did not discourage lawmakers there from making the cuts. … Indiana changed the formula it uses to calculate weekly benefit amounts so that the average unemployment check will drop from $283 to $220 a week. This makes things worse. It increases the risk of another drop in GDP. See, when people who have been getting unemployment benefits have their benefits cut, they cut their spending. That means some businesses are selling less stuff. Those businesses in turn layoff more workers, or at best case avoid hiring new ones. As for the argument that people who get unemployment benefits avoid working just to get the benefits, there’s two responses. First, even by the micro-economic models and theories so beloved by conservatives, it’s totally irrational to do so. I mean, do you really believe people pass up opportunities to have $48,000 a year or more (median household income) in order to collect $8,000 (maximum unemployment benefits for 26 weeks)? No, it’s totally irrational. Second, cutting unemployment benefits to try to get people to have jobs is essentially punishing the unemployed. If there are no jobs to be had, it makes no difference how much we punish them. They can’t get a job. The beatings will continue until morale improves. The unemployment rate increased to 9.2% (red line). …graph shows the job losses from the start of the employment recession, in percentage terms aligned at maximum job losses. The dotted line is ex-Census hiring. This was very weak and well below expectations for payroll jobs, and the unemployment rate was higher than expected (both worse). A terrible report. Although the Wall Street types and other analysts “expected” a better report, this really isn’t surprising. What it shows is the effect of fiscal policy. For over a year now, the actual effect of fiscal policy has been contractionary. Despite the misleading rhetoric of the Republicans, the Tea Party types, and the President, government spending has not been increasing for at least a year. The stimulus is over. It was done awhile ago. And it wasn’t much of a stimulus anyway relative to the scale of the problem. In fact, the federal government surge in spending in 2009, the so-called “stimulus” wasn’t really a stimulus. It was an attempt to limit and delay the damage from massive state and local government spending cuts. You would think that month-after-month of poor employment and job reports like we’ve seen this year would cause somebody in official Washington to be concerned. You would be wrong. Instead, the talk is all about how to cut spending further, faster, and deeper. Apparently 9.2% unemployment rate, no real increase in the number of employed, and 545,000 new unemployed people is just fine and dandy with official Washington. Nonfarm payroll employment changed little (+54,000) in May, and the unemployment rate was essentially unchanged at 9.1 percent, the U.S. Bureau of Labor Statistics reported today. Job gains continued in professional and business services, health care, and mining. Employment levels in other major private-sector industries were little changed, and local government employment continued to decline. The change in total nonfarm payroll employment for March was revised from +221,000 to +194,000, and the change for April was revised from +244,000 to +232,000. The distressing news here isn’t so much the rise in unemployment rate from 8.9% to 9.1%. Given the margin of error in measurement*, the unemployment rate has essentially been 9% for the last few months. The distressing part is three fold. First, the number of net new jobs created was only 54,000. We need at least 150,000 and closer to 180,000 net new jobs each month to keep pace with population growth. 54,000 is simply not enough. What’s worse, it’s a very significant drop from the March and April levels with no obvious explanation other than the economy overall is seriously slowing down. The second distressing item is the revisions to the April and March numbers. Normally previous months’ numbers are revised as the Bureau gets more and better data. But revisions typically aren’t very large and may be either up or down. But to have 12% and 4% downward revisions to the previous two months means the mild optimism folks were expressing two months ago was misplaced. Finally, the most distressing part news, but totally unsurprising, is that local government employment (think teachers and police) continues to decline and be a significant drag on the economy as state, local, and the national government continue to think they can cut their way to prosperity. They can’t. There’s no history or empirical evidence that shows drastically cutting government spending in the middle of a significant slump will bring prosperity. Quite the contrary, we have extensive theory and evidence that says cutting government spending in the middle of a slump will make the slump worse, make unemployment higher, and actually increase the government’s deficit. So just how bad is this continuing failure to recover from the Great Recession of 2007-09? Again Calculated Risk obliges with a great graphic. 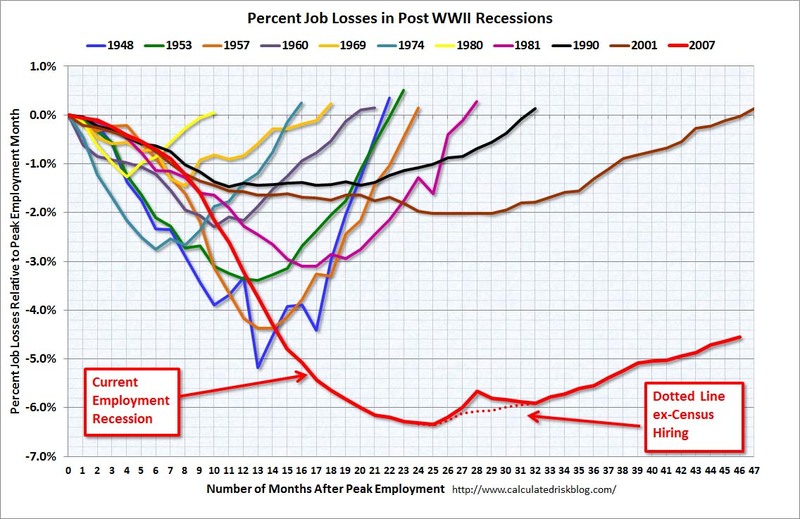 This graph compares each official recession since the end of World War II. 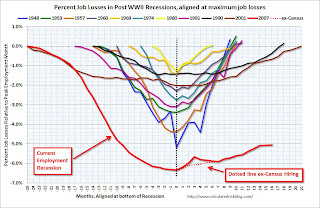 It plots the percentage decline in total employment (the loss of jobs!) by month and then shows how long it took to recover employment. At the rate we are “recovering” (it’s not really a recovery! ), it will be many years before we again get back to the employment levels we had when this disaster began to unfold in 2007. Without major changes in policy direction, we are definitely facing a lost decade for the U.S. There are a total of 13.9 million Americans unemployed and 6.2 million have been unemployed for more than 6 months. Very grim numbers. Overall this was a weak report and reminds us that unemployment and underemployment are critical problems in the U.S. In terms of lost payroll jobs, the 2007 recession is by far the worst since WWII. * for a more detailed explanation of how to read unemployment rate and employment numbers, see these four posts on the Employment Muddle Part I, Part II, Part III, Part IV. Well while I’ve been away from posting the last few weeks, things are starting to not look good. Two months ago I was concerned that the “recovery” was going to proceed at a normal growth rate and effectively close out those already unemployed from employment. I even have a draft long post about it called “The Invisibles” which I still hope to finish. But recent indicators show the economy may be slowing even further. We may be approaching “stall speed” where policy controls get sloppy and the whole thing crashes, again. In the week ending May 28, the advance figure for seasonally adjusted initial claims was 422,000, a decrease of 6,000 from the previous week’s revised figure of 428,000. The 4-week moving average was 425,500, a decrease of 14,000 from the previous week’s revised average of 439,500. 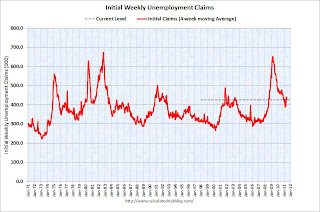 The following graph shows the 4-week moving average of weekly claims for the last 40 years. The dashed line on the graph is the current 4-week average. The four-week average of weeklyunemployment claims decreased this week to 425,500. This is the eight straight week with initial claims above 400,000, and the 4-week average is at about the same the level as in January when there were fewer payroll jobs being added. This is a notoriously “noisy” data series, meaning it’s highly volatile and jumps around a lot. But after 8 straight weeks at the elevated 400,000+ level, we can conclude it’s not just noise. There’s a signal here. Layoffs are resuming. Employment in the nonfarm private business sector rose 38,000 from April to May on a seasonally adjusted basis, according to the latest ADP National Employment Report® released today. The estimated change of employment from March 2011 to April 2011 was revised down slightly to 177,000 from the previously reported increase of 179,000. May’s ADP Report estimates employment in the service-providing sector rose by 48,000, marking 17 consecutive months of employment gains while employment in the goods-producing sector fell 10,000 following six months of increases.Manufacturing employment fell 9,000 in May following seven consecutive monthly gains. Note: ADP is private nonfarm employment only (no government jobs). This was well below the consensus forecast of an increase of 178,000 private sector jobs in May. This doesn’t bode well for tomorrow’s official May employment situation report. For more background on what these stats mean, see my series from February here, here, here, and here.